This morning Ann and I were talking and she mentioned that it had been almost four years since she has driven on the highway and three years since she has been behind the wheel of a car. Life getting around in a motorized wheelchair has certainly been an eye-opening experience for the both of us. Handicapped Parking: Generally speaking parking lots have marked off parking for people in walkers. Most parking spaces designated with the wheelchair image cannot handle a van with a ramp and if there is one it is generally occupied by a sedan. Sometimes cars are parked in the striped areas making it impossible for a van to use. 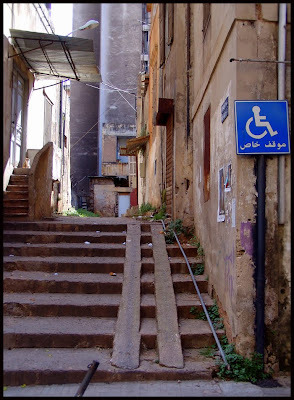 Sidewalks: The Americans with Disabilities Act of the early 90s has greatly improved the ability of a person in a wheelchair to use sidewalks. Even so my wife has to use the street, in her chair, to get to the grocery store which is a few short blocks away. Restaurants: Ann has developed an amazing phone interview process for these places. The initial response is almost always "Yes, We are accessible!" After a few questions (like "Do you have grab bars in the restrooms?") Ann will sometimes discover that the place is not wheelchair friendly. And strangely enough, even hospital restrooms are not always accessible. Realtors: We have been considering a move for some time to make living a bit more accessible for Ann. Most home search websites like realtor.com have a wheelchair accessible category but the homes that show up usually are not accessible. Might have a grab bar in the tub but a wheelchair could not navigate their. Traveling: Another difficulty for us. Plane travel is really not an option. Traveling long distances in our van is not easy so we generally don't do much of it. Ignorance: Even in this age of enlightenment concerning disability I find that people can still talk down to people in wheelchairs. My wife is a brilliant person with a long resume of amazing work accomplishments but some still treat her like she has a mental impairment. Granted it is rare. And maybe I am overly sensitive. Its amazing that we've not become better at addressing the needs of someone in a wheelchair. When I took care of a lady who was in a wheelchair I was schocked to find the same things you have mentioned here. Handicapped parking is definately not adequate for a van with a lift. I used to have to back the van out and then get out and let the lift down to let her get in - all while blocking other traffic. @Amber - We can so relate to that. Some places in the KC area have "Van Only" parking spots but mostly the spots are "Van Accessible" and are often taken by sedans. After our daughter's horrendous car accident in 1989, she was wheel chair bound for some time. We were amazed at the same thing back then. How hard it was to get though aisles. We went to a event at the Arco Arena in Sacramento.... it was terrible... the only place to fit her wheel chair was in the nose bleed section, where we couldn't see what was going on. Now, the upside of this, both my daughter and I are so sensitive to people in wheelchairs, and treat them as "normal" people who just can't walk. People can be so rude.... Thanks for this gentle reminder. KB - several years back my daughter Emily broke her leg and was in a wheelchair for 8 weeks or so. Thankfully, only a short time but certainly long enough to get a glimpse of how difficult life in a wheelchair can be, especially when it comes to handicapped parking! I yelled at more than one parent who inconsiderately parked in the school's handicapped spots just to drop their kid off. Ugh!!! In the NY-NJ-CT area handicap parking permits are sold to people who have more money than ethics. When a healthy couple parks their Mercedes SL convertible in a handicap parking space because they have a permit, it isn't because either of them is handicapped. Well, maybe ethically challenged but they don't issue permits for that. This practice isn't limited to the rich but it feels like a greater injustice when the rich do it because they feel entitled. Everybody else does it only because they don't care.